Mark and Alan arrived safely last evening, via Chicago and Amman. Today they pitched in as if jet-lag were nonexistent. We are grateful for safe travels and for the full program we experienced today, including a visit for orientation to the World Vision office in the Bekaa Valley. 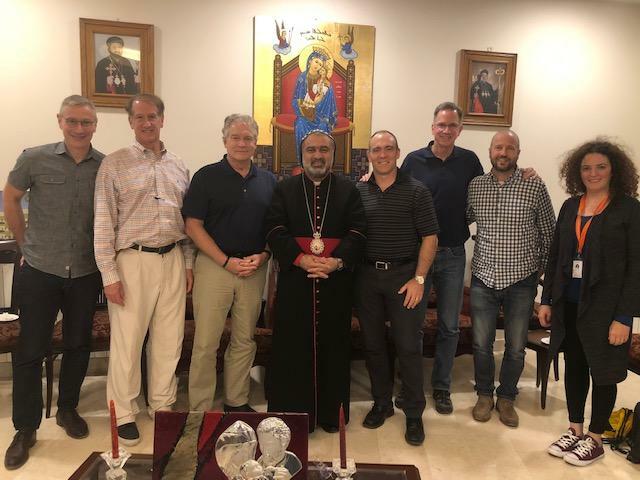 We also visited a couple of "Informal Tent Settlements", and ended our time in the Bekaa by meeting with Archbishop Boulos Safar of the Syriac Orthodox Church, for a frank discussion about relief work, Christian unity, and the importance of following Christ as our only real Truth (photo above). We will follow up with more on these experiences. For now, I wanted you to know that team "LG3" is together, in country, and functioning at a high level. Thanks be to God! Thanks be to God for the safe travel and arrival of LG3! And thank goodness that someone was able to find a sign to remind Pastor Mark to be positive for a change!